IKEA can be a stressful enough place to be without staring at a shelf, trying to mentally guess how much space it takes up in your living room, and if the color matches the table. Now that Ikea has released the ARCore app Ikea Place for Android, it is possible to place furniture in your home before buying. We tried out this AR solution to see how useful it could really be. ARCore is Google's AI platform, meant to provide an Android alternative to ARKit, Apple's augmented reality platform for iPhones and iPads. Ikea has been offering an app for ARKit for some time, but now the port to ARCore brings the joy of furniture placement to Android. During set-up the app explains the most important basics of operation and demands the necessary rights - first and foremost for the camera. The whole thing is done in an IM chat-style interface. The app has several features, the most practical of which is the ability to place furniture virtually in the room for planning purposes. Does the sofa really fit where you were wanting it to go? And does it look as good as you imagined it in your head? These are the kind of questions that the Ikea Place app can answer. The app has the complete current Ikea catalog in stock for you to try out. Putting IKEA furniture in the room is very easy: choose one from the catalog and place it in the room with a tap. Then the object can be rotated and moved. Once placed, just stand up and look at it from every angle to see if it's really what you want. This feature is particularly useful to find out whether the piece of furniture fits into the room visually. Millimeter-fine planning should not be left to the app: It is not said that the dimensions are perfect - we measured deviations of several centimeters on a Billy shelf. Sometimes the app glitches and furniture jumps back and forth - an app restart usually helps, but then you have to start again from scratch. What else can the IKEA Place app do? One nice gimmick is its ability to identify objects and provide a suitable IKEA offer. Nice gimmick, especially if you have seen a fabulous stool in a chic bar, which you just have to have in your own living room. The hit rate in our test is quite good. You can also set favorites and place Billy shelves wherever you want. An ARCore-enabled smartphone is required. Naturally, Google's Pixel smartphones are great for this, but also the Galaxy S7 or S8, for example. 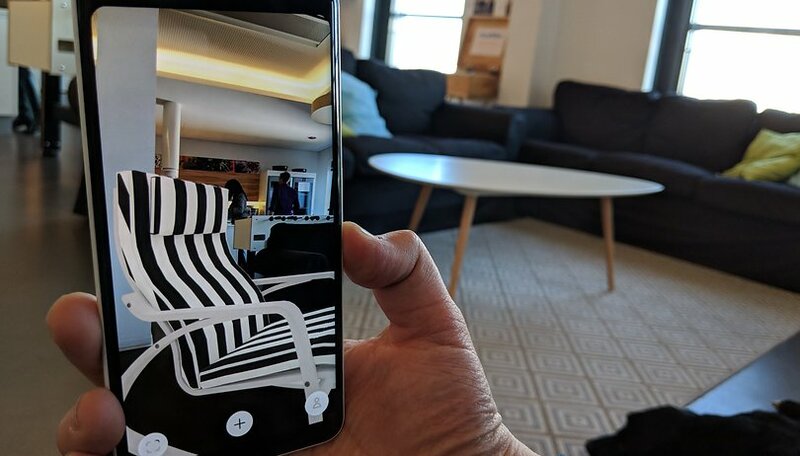 Will you try the new Ikea app on your ARCore-enabled smartphone? What do you think of the features? This is a very helpful application, which I am sure will help IKEA shoppers. AR is becoming increasingly popular with mobile games and now it looks as if AR is making its way to utility apps. Great article Hans-Georg Kluge.